A workshop on modelling flooding from intense rainfall with participants from NERC Franc, Sinatra (and Tenderly) projects as well as local stakeholders with interests in flood risk assessment and response was held in Morpeth, Northumberland on 20-21 Sept 2016. Morpeth has had a long history of flooding, with large events in 1963 following snowmelt, and in 2008 when 1000 properties were affected by a 1:137 year event with a peak flow of 360 m3/s. The aim of the workshop was to develop an integrated modelling strategy to demonstrate end-to-end forecasting capabilities for a single location, including assessment of different modelling approaches for catchment and urban flood modelling, sensitivity to theoretical patterns of convective and frontal storm event movement of river/stream flows and inundation in the Wansbeck catchment, local tributaries, and town centre, and effects of flooding from multiple sources. 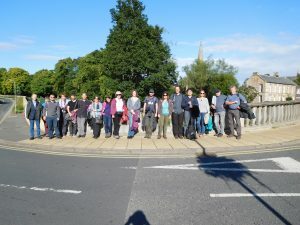 An informative field trip was held on the first day, with attendees inspecting the £27M Morpeth flood alleviation scheme, including new and improved flood barriers in the town, the upstream storage reservoir dam and culverts, and ‘log-catcher’ poles which are designed to prevent impacts of woody debris on infrastructure in the town. This was followed by a visit to the contrasting Dyke Head site in the upper catchment, where a set of Natural Flood Management features have been installed demonstrating an alternative low-cost approach to reducing flood risk. The main workshop discussions were held on the second day, in the ‘Glass Room’ of the Waterford Lodge Hotel in Morpeth. 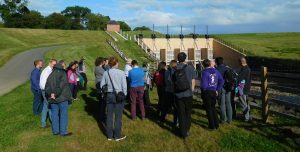 A structured modelling strategy was agreed, informed by approaches used in the Environment Agency/JBA’s Real-Time Flood Impact Mapping Project. 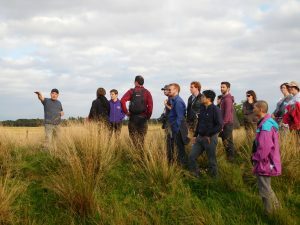 Models used and developed within the research projects and industry-standard models used by consultancies are being applied at the full Wansbeck catchment scale, and at very high resolution in urban areas. Simulations are first being run for the 2008 flood event, with comparison against flood depths reconstructed using crowd-sourced information. We will then assess model performance in simulating flooding from multiple sources (fluvial and pluvial) from hypothetical extreme events with different spatial positioning over the area. Evidence from recent floods in Morpeth support wider understanding that flooding from rivers and from localised rainfall both have significant impact, but their combined effects (e.g. when high river levels restrict discharge from storm drain overflows) can be locally complex. The expected outcomes from the study will be improved understanding of capabilities of models used in flood response in the UK for simulating catchment and urban processes, specifically with respect to end-to-end modelling of flooding from multiple sources. The afternoon session focussed on understanding more about the needs of communities and organisations for real-time flood risk information, as the first activity in Work Task 3.2 of the Tenderly project. Representatives of first responder organisations (Environment Agency, Northumbrian Water, Northumberland County Council) and flood-affected communities (Morpeth Flood Action Group, Northumberland Community Flood Partnership) provided a range of interesting perspectives on how information is used in during periods leading up to and during flood events. In the Tenderly project, this will help to inform how to make better use of methods developed in Franc and Sinatra and of all sources of information, including improved forecasts of convective as well as frontal rainfall, real-time flood modelling outputs, and crowd-sourced information. This entry was posted in Uncategorized on October 17, 2016 by robt.